In our last installment of this series, When is a Horse a Horse? we recognized that the living species of equines (horses, zebras, donkeys etc..) represent groups of genetically divergent individuals that naturally do not interbreed on a regular basis. Each of these lineages of equines is behaving as a species as defined by the biological species concept. This raises the obvious question for those interested in exploring the origins of equine diversity: are each of these distinguishable equine species based on morphology (the way they look) and their genetic differences the product of special fiat creation or the product of a process of speciation from a common ancestor? It may surprise you to learn that secular evolutionists, evolutionary creationists, some intelligent design advocates, and most young earth creationists and whatever combination that I have left out, have the same answer: all equine “species” today are the descents from a common ancestor that lived sometime in the past. To be more blunt, all parties agree that if we went back in time we would eventually come to a point where there were no clear differences between horses, donkey’s and zebras but rather any observer living at that time would have recognized the existence of a single species. What origins models (evolution, intelligent design, young-earth creationism etc…) do not share are common views of what that common ancestor may have looked like, how far back in time we would have to travel to find that ancestral species and the mechanisms of evolution required to generate the present-day groups of species. To illustrate, let us look at what young earth creationists have in mind when they say that all of today’s horse species are derived from a common ancestral stock. A few years ago several young earth creationists including Todd Wood, a leading figure in framing the creationist concept of “baramins,” (Thoughts on Baraminology) attempted to apply a set of criteria for understanding the limits of the horse baramin, which is a way of saying finding the limits of how far the originally created horse kind could be stretched (see references below). For our purposes we can say that they were asking the question: when is a horse a horse? A modern horse shown looking at its ancestor on the right. This small dog-sized animal had multiple toes and ate broad-leaved plants rather than grass. It is this “horse’ that some creationists’ are proposing that Noah’ preserved on the Ark. Before you scold me for quote mining to make my point, let me clarify what I believe that Wood intended by this conclusion. Dr. Wood is only referring to the actual existence of horse-like fossils, their relative order and that all these fossils and living horse species have a common ancestor. Dr. Wood very much believes in the special creation of the original horse kind and is not convinced that secular evolutionary theories (natural selection, genetic drift and mutation) can fully explain how these horses evolved from that original horse kind to the many species and fossil species we know of today. I don’t have time here to explore his idea of altruistic genetic elements (the AGEing process) at this time but will explore his and other creationists’ views of how evolution happened within kinds in a later post. However, I must give Wood credit for recognizing the veracity of the fossil record, realizing that is must represent a post-flood series within the young earth creationists worldviews, and seeing the implications for the question of the origins of horses. You will not be surprised to hear that not everyone within the creationist community are ready to accept that this standard example of macro-evolutionary evidence might be correct given it has been labeled as being an outright fabrication for so long. At least two articles have been penned by creationists (see references below) about horses. In one, Mats Molen, responds to Wood’s assessment of horse evolution and takes the position that there are at least two “evolutionary gaps” in the series and therefore rather than a single horse “kind” God must have made at least three created kinds rather than all having evolved from one to another. However, with respect to seven living species of horses he believes they are all one kind and therefore derived from a common ancestral pair of horses on Noah’s Ark. Let’s not lose sight of Molan’s conclusion that there are “gaps” between the living horses and most fossils species and even gaps between some fossils species. He believes those gaps exclude any possible common ancestry among the fossils that evolutionary biologists have concluded are part of the common ancestry of modern horses. Dr. Wood and colleagues think differently which brings us right back to our original question: what makes a horse a horse? These “gaps” sound really interesting because presumably they define one group from another and thus could tell us what is a horse and what isn’t. Alas, the author gives us virtually no criteria for determining what a “gap” is between kinds or how we would recognize it leaving us to guess which is rather unhelpful. Long ago, when a “species” was equal to a “kind” in most creationists’ minds, gaps where a bit easier to define. Every species was specially created, preserved on the Ark and then was represented in the fauna today with only minor micro-evolutionary changes. But today, most creation scientists are more apt to see species as just pools of genetically similar individuals that are actually part of a much larger unit called a kind which may include hundreds of species. These “kinds” are more difficult to define than species which we have seen is not easy task itself. Boundaries between kinds can be fuzzy and they get much fuzzier when the fossil record is included. In the case of horses, the fossil record appears to contain a gradation of animals from small canine-sized multi-toed broad-leaved plant herbivores to the large grass-grazing zebras and horses of today. Let’s look at a second paper about horses written by a creationist. This one is by Jonathan Sarfati who is rather famous for his creative reinterpretations of evolution and the fossil record. His article written in 1999 predates Wood’s assessment but I see no evidence in his recent writings that he has changed his mind. He does not claim outright that the 25 or more genera (and 150+ species) of living and fossil “horses” are not one created kind but he blasts the traditional evolutionary view of modern horses as having evolved from a small multi-toed ancestor. Rather, he believes that all the fossils species were all contemporaries of each other and thus could not represent a series of evolutionary steps. 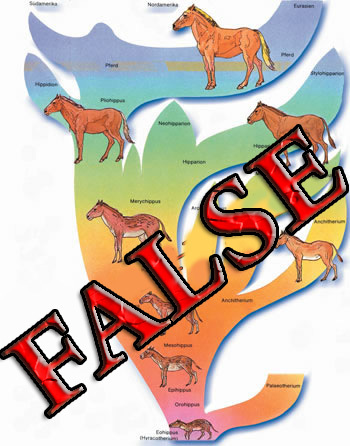 He appears to accept that all fossil horses (all those shown in the figure above) are actually just natural variants within a horse kind but for him this doesn’t constitute any form of evolution. How does he do that? An important part of the biblical creation model is that different kinds of creatures were created with lots of genetic information. Natural selection can sort out this pre-existing genetic information, by eliminating creatures not suited to a particular environment… Also, much of this (created) genetic information may have been latent (hidden, i.e. the features coded for are not expressed in the offspring) in the original created kinds. They also had other controlling or regulatory genes that switch other genes ‘on’ or ‘off.’ That is, they control whether or not the information in a gene will be decoded, so the trait will be expressed in the creature. This would enable very rapid and ‘jumpy’ changes, which are still changes involving already created information, not generation of new information. Applying these principles to the horse, the genetic information coding for extra toes is present, but is switched off in most modern horses. Sometimes a horse is born today where the genes are switched on, and certainly many fossil horses also had the genes switched on. This would explain why there are no transitional forms showing gradually smaller toe size…. These mechanisms would explain the alleged horse evolutionary series as variation within the equine (horse) kind. The amount of variety within living horses, undoubtedly one kind, supports this. What Sarfati appears to be saying is that all this variation in the entire horse “series” which includes at least 150 different recognized species are all just variations within a single kind and that this variation was produced by genes being switched on and off to cause “jumpy” changes that would make the transitions to new species appear suddenly. Wikipedia Macrauchenia a South American fossil ungulate. He is promoting a form of what he and other YECs like to call de-evolution. He believes the horse kind was created with many regulatory genes and some have been turned off over time resulting in loss of information. As a result Sarfati argues that we find many forms of horses that evolutionists have simply tried to put into some sort of order of progressive evolution. As best as I can tell, he seems to be open then to a four-toed ancestral horse that had genes turned off resulting in the loss of toes so that all the living horses today have one toe but he is not going to call this evolution but rather a loss of information resulting in large morphological changes. Rather than a series of steps from one horse to another I think he rather sees the evolution of horses as a tangled bush rather than a tree with one created “kind” of horse in the middle and then all the species being formed directly from that ancestral population. We will examine this in more detail in future installments of this series but for now I would say that Sarfati’s de-evolution claims are little more than hand-wavy explanations that have little bearing in the reality of our knowledge of genetics or the fossil record. He doesn’t account for the sequence of fossils in successive layers of rock nor does he really define the boundaries of where a horse kind ends and other kinds in the fossils record begin. For example, are fossils from Macrauchenia (pictured above) of South America remains of a different kind of ungulate or should we also lump them in with the equine kind and how would we tell? I can’t help but point out the irony of Sarfati’s use of “jumpy” changes in organisms. He is trying to use quick changes due to regulatory genes being turned on and off to explain how there can be such big differences between members of the horse kind including fossils of horses that have different numbers of toes, different shaped teeth, and even different chromosome numbers. The result of such fast jumpy changes should be that intermediate or so-called “missing links” would not be expected to exist. So here we have Sarfati providing a legitimate reason why missing links are not to be expected between all species genera or even families of organisms and yet he is one of the first to make fun of evolutionists for not providing those missing links to prove that organisms have evolved from common ancestors. When Ken Ham opened his Ark Encounter theme park he included on the ark representatives of what the Answers in Genesis science advisers believed might be the ancestors of the various “kinds” of animals that Noah preserved. These animals are said to have stored all the genetic information for allowing them to evolved into the thousands of species that exist today and all the fossil species that were preserved in post-Flood catastrophes. They have a pair of “horses” on display. These horses are about the size of a Great Dane and have three toes. So it appears they also believe some of the oldest fossils of horses represent the original horse ancestors which was much smaller and had different feet than today’s horses. In Part IV I will explore the problem that each of these explanations for the origin of horses today have in common. Again, worth remembering that what ever “kind” was on Noah’s Ark what have had to evolve into horses fit for Pharaoh’s cavalry within some 1500 years. For non-creationists, nothing very much hangs on the problem of precisely defining “species”. Darwin was quite explicit about this. There is a continuum between what you would describe as differences between varieties, and differences between species, and as you pointed out earlier this must always be the case for species that have diverge from a common ancestor. It must also be the case when we distinguish between success species, just as there must be some purely arbitrary drawing of a boundary if we try to distinguish between vulgar Latin and Italian. But for creationists, there must be a sharp yes/no distinction; were A and B created as separate kinds, or are they different examples of the same kind, and there is no possibility in between. Paul, yes, the fact that the bible doesn’t record this ultra-fast speciation should be the most compelling reason for YECs to abandon it. Part V of the series will stress this very idea, that horses (as a species and even a domesticated variety) have been around for a long time according to the Bible. They don’t even get 1500 years. The flood story takes place aroudn 2400 BC in biblical chronology, and the exodus story with Pharaoh’s chariots around 1400 BC. All of the YEC sources I have happened across list the flood in about 2900 B.C. or a little earlier. Stiil recent enough to require incredibly rapid speciation. Ussher’s dating put it at 2348 BC, and I think that’s as accurate you can get with biblical chronology. Our of curiosity, what sources are you referring to? As mentioned before, AIG puts the Flood at 2348 BC, and CMA at 2304 BC plus or minus 11 years. I can’t find where ICR gives a specific date, just vague estimates such as “some 5000 years ago” which is understandable in view of Henry Morris frequent hedging in the Genesis Flood and other writings. https://www.icr.org/article/406. CRS doesn’t take a position on it in their Statement of Faith. I used to subscribe to the CRSQ quarterly and don’t recall if any of their contributors took a firm stance on a Creation or Flood date. I’m pretty sure most agreed the Flood was less than 10k years ago, except for Gerald Aardsma, who in 1992 argued based on tree rings and correlated C14 dates that the Flood must have occurred more than 10,000 years ago, without saying how much more. People familiar with (retro)transposon activity in genomes know that over evolutionary time there were distinct burst of activities intermitted by long periods of silencing. These burst are even in conventional evolutinary thinking causative factors for speciation events. Such bursts do not require millions of years, since they are instant events. Transpons are active or non-active. There is no in between. Even in the light of current biological understanding they are miraculous, since they bring forth novel species without transitions. Darwins Gradualism is completely wrong. The school of the Goldschmidt was right. The fossil records is littered with hopeful monsters. Genomes are prepared to vary, to adapt and to speciate. In this view a non-random burst of tranpsoson activity rearranged the genome of the proto-horse (the proto-horse baranome) and within a view generations the horse, zebra and other equine species arose almost simultaneously. Selection did not play a role. Read my book and you know how it works at the molecular level. I’d like to make the point (having just submitted a review on this topic): the main evolutionary change in horse feet is not in the number of toes, but in the evolution of the “spring foot”. That is, the transformation of the foot from one that has an underlying pad (as in tapirs and rhinos today), to one that has lost the pad, elevated the fetlock joint off the ground, assumed a fully unguligrade foot posture (i.e., standing like a ballerina en point). The “spring foot” has an enhanced system of supportive ligaments (evidenced in the bony anatomy) that allow for elastic energy storage during locomotion in the flexor tendons. This change happens in the derived anchitheriine horses (e.g., Parahippus), a form which Molen claims represents the edge of one of the “gaps” and to represent “a mixed up group of unrelated fossils”. Both pad-footed horses and (most) spring-footed horses have three toes (four toes in the forelimbs of the earliest radiation of hyracotheres), but in the spring-footed ones the toes do not routinely touch the ground during locomotion.The reduction of the number of toes from three to one is a rather minor issue in a small lineage of later horses, that just happen to be the ones that survive to the present day. Interesting post. As long as creation scientists follows the path of evolution scientists when it comes to understanding genomes, they will make no progression. The genomes of created kinds, which I coined baranomes, had an intrinsic ability to vary, adapt and bring forth novel species as instant genetic events (probably even as a response to the environment), The reorganization of chromosomes is sufficient to unleash novel phenotypes. Novel traits emerged from the genomes in a similar way as recently shown for the blue eyes of the Husky: One single duplication event of a non-protein coding part of the genome induces blue eyeness. Copy number- and position effects of the same genetic information in responsible for speciation. There is no need for natural selection and long ages are not required. What has been overlooked by all biologists is the bauplan of an organism. The focus has been always on the protein-coding genes, but they make up only the minor part of the genome and only code for tools. The bauplan itself is not in the genes, but rather it is determined by the distribution of the genes in 3D space-time is the nucleus. The spatial distribution is the bauplan. So, there is no novel information required to build, say, the 8 different species of muntjac deer. A reshuffling of the chromosomes was sufficient ad this is what we observe in karyotypic analyses. In this way, some of the deer even “evolved” fangs. It is just a matter of differential expression of the same genes. Interesting, peer, that you cite the duplication event of a small part of a chromosome causing a change to blue eyes in huskies without, it seems, realising that such undirected, chance duplications of preexisting genetic material, along with equally chance excisions, small “mistakes” in transmission, and the reshuffling during reproduction that you also refer to, are precisely the way that evolutionary scientists claim genetic variation occurs and new genomes are generated. You then dismiss the role of natural selection in determining which variations become fixed in the wild populations, without giving any explanation of how YOU think it happens. The blue eyed gene is a relative newcomer in humans too. Our ancestors were once all dark eyed – dark skinned too – in the days when they all lived in Africa, and this gave them protection from the fierce Equatorial sun. Natural selection ensured they stayed that way. If any blue-eyed or pale skinned mutation chanced to appear in an individual at that time, it would put its owner ( and any descendants with copies of the new gene that he managed to produce) at a disadvantage compared to his darker complexioned or darker eyed fellows, with no compensatory advantages. Long term, the gene had no chance of surviving in the breeding pool, with its owners less able to bear the hot sun, and more liable to skin cancer. However, when some humans migrated out of Africa and even, gradually, to Northern Europe, if such a chance mutation occurred in such a population, it did not have the same disadvantage, in the much weaker sun, and light skin actually conferred the benefit of allowing sufficient vitamin D to be absorbed from the lesser amount of sunlight. So natural selection meant that the new gene prospered and spread in those populations. That’s why people of Scandinavian ancestry tend to be blue eyed and fair skinned and haired, while those of comparatively recent Central African ancestry are dark skinned and dark eyed and haired. Thanks for your reply, Sally. You have understood the role of natural selection: conservative and preserving essential traits. The spread of blue eyes in the human population was just drift, not selection. It may even be due to a non-random recurring (transposon-driven) mutational event. What you do is conforming to the false Darwinian mainstream opinion, which has been completely overturned by biological fact. If you look up my publications you may get a feeling for my theory of instant and directed evolution from baranomes. We will also become familiar that helpful mutations are not random at all. The occur over and over and over. Independently. It is also in my book. The genoem is prepared for adaptive phenotypes, for speciation. Also read Sanford and Caporale. We have been around now for over ten years and I can see a new paradigm acoming. Why don’t you submit an article to Science or Nature? Wouldn’t you like a Nobel Prize? Yeah, the inconsistencies know no bounds. Speaking of angiosperms, we have not heard from Peer or Robert on why we don’t find pre-Cretaceous pollen (nor any other physical angiosperm remains), or any answers to the other fossil record problems Paul and I pointed out. Of course, YECs also have to explain how thousands of angiosperm forms (or their seeds) survived the brackish waters of the year-long Flood or regenerated quickly in substrates and habitats far different from their usual ones (consider for example, plants as diverse as rain-forest flowers and bromeliads vs desert cacti). Even if Peer and Robert want to argue that there were far fewer flowering plants before the flood, and they were all one or a few kinds, and that whatever ones survived quickly evolved into thousands of species–what would be driving all that diversification? After all, the Flood would have turned the Earth into a largely uniform, foreign environment, and they don’t allow any role for natural selection in speciation. Peer, you say that in your model, there is no need for natural selection, yet you assert that genetic changes occur in response to an environment. So what triggers those genetic changes, and how to they end up matching environmental needs or pressures, if not by natural selection? Peer, did it ever consider that to the extent TEs do what you say, their existence and mechanisms could have originally evolved through natural selection? You suggest TEs and epigenetic changes “drive” evolution, but have not explained what is triggers and preserves these TE effects, if natural selection is not involved. Moreover, the idea of epigenetics having even a small role in evolution is controversial, let alone the assertion that it is the main or only driver of evolution. You say biology is mostly Lamarckian goes, but can you cite any papers (YEC or otherwise) that reliably document any evolutionary changes driven primarily by Lamarckian mechanisms? Even if you could give some clear examples, I don’t see how it refutes all the evidence for the key role of natural selection in evolution overall. Like many other YECs, you claim that mutations can’t create novel genetic sequences, but this seems demonstrably false. For instance, if you have a chromosomal mutation (involving part or all of the chromosome), it provides lots of new substrate upon which further mutations can occur and be acted upon by natural selection–creating new genes and alleles over time–which is new information by any reasonable definition. And again, without natural selection, how are any genetic changes going to be preserved and result in environmental adaptations? If you’re suggesting that it was all pre-programmed by the Creator a few thousand years ago, that will not fly with most scientists, especially in view of all the evidence for fossil succession and an old earth. Moreover, even if TEs could operate in the way you suggest before the Flood, after the Flood you have ultra-severe genetic bottlenecks, which by all evidence, do not produce the hyper-rapid, dramatic evolutionary changes you propose, but the opposite. For example, animals like cheetahs apparently were genetically bottlenecked several thousand or more years ago (but far less severely than a single pair), resulted in many centuries of genetic stagnation and low diversity, which we still see today. Yet somehow you imagine all marsupials, from Koala bears to kangaroos to opossums, all arising from a single marsupial in a few centuries, or animals as diverse as Titanotheres and zebras arising from a single horse/rhino pair? How do reconcile this stark inconsistency between your claims and what the empirical evidence shows? Just to note: “fangs” (i.e., hypertrophied upper canines in the males) are a basal (i.e., primitive) feature in ruminant artiodactyls in general. They are seen in all of the early small forms that lack any kinds of horns or antlers (traguloids) and are retained today in the surviving traguloid lineage, the mouse deer or chevrotains (family Tragulidae). Among the (usually) horned ruminants (pecorans) those canines are retained in the basal, hornless members and in the only family that never evolved horns or antlers, the Moschidae (musk deer, actually more closely related to antelope than to deer). In the deer family (Cervidae) many of the early forms had small antlers but also retained upper canines in males, as seen today in the muntjaks and in the Chinese water deer (where antlers are absent, apparently secondarily lost). So: the distribution of ‘fangs’ in ‘deer’ is well-understood. It is not a new occurrence in some species resulting from chromosome reshuffling. Great resonse, Christine. Good to see that this trait is alreazy present in the baranome of the ruminantia. No new traits even have to evolve, the programs are already prescribed. They only have to be expressed, supressed or amplified. The only role for natural selection here is to preserve the prescribed program for these “fangs”. The expression and amplification is highly flexible and is performed by the millions of TEs operating in the genome. Reshuffling is all that is required for novel species to arive. It is almost instant and Darwin and the long ages are not required. Peer, you say “…long ages are not required.” Even if this was true, you are again ignoring all the evidence that long ages were involved for many evolutionary changes. You can’t just close your eyes to the fossil record. You have not explained, for example, why there are no pre-Cenozoic fossils of any large modern mammals, or any unambiguous pre-Cretaceous diatoms or pollen, or why the patterns of fossil succession for countless other groups contradict YEC/FG expectations, often in very stark ways. Please don’t offer the YEC cliché’ that the geologic column is an artificial construct of evolutionists. Every paleontologist, fossil collector, and serious student of Earth history knows better. Not only can we consistent fossil patterns for ourselves in the field, but the relative order of geologic periods and characteristic fossils in most of them was worked out before evolution was even well accepted. 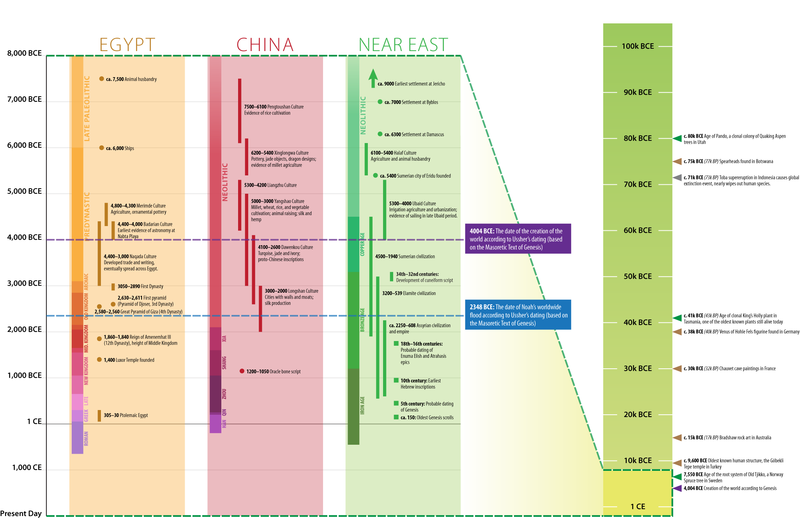 Contrary to the common YEC claim that we can’t see the actual column anywhere, there are at least 31 sites around the world where every period of the geologic column is exposed, with all periods and associated fossils in the expected evolutionary orders. Moreover, there are tens of thousands of sites where multiple periods are exposed, again, consistently in the mainstream order, The few alleged exceptions often cited by YECs in the past have been well refuted. Any plausible model of Earth history has to all of this into account (along with genetic and biologic evidence), and I have yet to see any YEC model that does. You are too kind to the YEC position. Even if one refuses to accept the rather obvious facts of stratigraphy as known since Hutton and William Smith, the YEC still has the intractable problem of explaining why all ammonites and non-avian dinosaurs are found beneath the K/Pg boundary layer, and all existing identifiable mammalian “kinds” above it; why all terrestrial vertebrates are found in levels at or above the level that geologists have for well over a century designated “mid-Devonian”, and so on, and, at much finer levels of detail such as that forming the subject matter of this post, for every case of extinction, or of the appearance of biological novelty. Paul, thanks for pointing out more examples of major ways that the fossil record directly contradicts YEC claims. I recall that one of the first YEC books I read (while in college) was Duane Gish’s “Evolution: the Fossils Say No!”. Over and over and he stressed that this and that group of organisms appeared in the fossil record “complete and funny functional”, without mentioning the key fact that they do not appear all at once, but in consistent orders the world over (and orders completely incompatible with YE/Flood Geology). He also ignored or dismissed the many intermediate forms we do know, which of course are “complete and fully functional.” My realizing this, and personally observing evidence of fossil succession in the field (and evidence of periods of slow and non-deposition as I started studying dinosaur tracks) began my movement away from YECism. Among YECs, some place the flood/post-flood boundary back at the Cretacous-Paleocene boundary (Snelling, Ross), and others around the end of the Pliocene or beginning of the Pleistocene (Oard, Walker). If the flood deposits go right up to the Pliocene, then most of those pesky equine fossils were deposited during the flood, during which baraminological hyperevolution could not have been occurring. But for those YECs who place the end of the flood back at the end of the Cretaceous, the “horse series” occurs in rocks deposited during post-flood residual catastrophism, a time period in which this baraminological hyperevolution supposedly occurred. The geological problems with this post-flood deposition of most Cenozoic rocks are myriad. The thickness of the Cenozoic is thousands of meters in places, yet this group of YECs believe that this was also a time of mass migration of animals, and people, from Ararat to the ends of the Earth. It is hard to envision any kind of migration occurring while sediments were being deposited at catastrophic rates, prohibiting the growth of any substantial vegetation. Migrating animals and humans need food, and these sediment-choked wastelands would not have provided any. It must also be noted that Cenozoic sedimentary rocks preserve ancient environments such as forests, grasslands, and lakes. These ecosystems take time to develop, and the YEC model does not allow for the passage of enough time. As icing on the cake, YECs want to squeeze an entire ice age on top of this. 2a. Deposition of hundreds to thousands of meters of sediments. Many other geological events had to occur at the same time: volcanism, intrusion of large batholiths, metamorphism. 2b. Baraminological hyperevolution of equines and thousands of other groups. 3. Ice age. Actually ice ages, as there is abundant evidence for multiple glaciations. 4b. The stone age, including Neanderthals. 4c. Migration of modern humans to all parts of the globe. 5. Abraham arrives on the scene in a society that already has a couple thousand years of history. All marsupials may stem from one single marsupial-like organism containing a large undifferentiated pluripotent baranome. All extant and extinct marsupials arose in single events from this baranome, in a very similar way as the 500 cyclids arose in the victoria lake. “Hopeful monsters” that originated in non-random mutational events, driven by TE bursts. The first Marsupial banome was probably carried to australia as a pet….in the boats of what evolutionists call Homo erectus (but who were just Homo reshuffeled baranome derivates). Apart from the fact that the genotypic and phenotypic diversity of marsupials is several orders of magnitude greater than that of Lake Victoria cichlids (which represent a subfamily rather than an infraclass), this scenario poses some problems. What about the marsupials in South America? Were they carried there as pets too? The “kinds” that diverged after the flood are usually considered to be equivalent to present-day families: e.g., the horse kind, the dog kind, the cat kind, etc. There are around 118 families of placental mammals today (although I suspect that creationists would collapse many of them into a single kind, such as the ‘rodent kind’ and the ‘bat kind’) and 21 families of marsupials (3 of those South American, 2 of the Australian ones are extinct but only within the past 100 years, and here were a number families that only went extinct at the end of the Pleistocene, including a rhino-sized one). If all of those marsupials represent a single “kind”, then what was limiting their divergence into lineages equivalent to the level of placental “kinds” in the intervening ~200 years between creation and Noah’s ark? There are also native rodents in Australia. I don’t mean the rats and mice brought by Europeans, but the endemic muroids such as hopping mice and giant water rat that have been present for around 5 million years. Did humans bring those too? If so, why haven’t then also diversified into different types to the extent seen in marsupials? We do know of one kind of mammal brought by humans, the dingo (a subspecies of the domestic dog), known from around 4000 years ago. However, that’s a lot longer than you would give for all of the marsupials to radiate into their current diversity. What genetic factors were limiting the radiation of dingos into a diversity of predator types? Why bother? When the animals get off the ark, there are no plants. The whole preserved biosphere goes extinct in a few weeks. The Seraplon Brotherhood wrote: “Why bother? When the animals get off the ark, there are no plants. The whole preserved biosphere goes extinct in a few weeks.” YECs will of course dispute that, but at best there would be massive ecological devastation, and certainly not conditions fostering the survival let alone hyperspeciation of most vertebrates and plants. Even many aquatic organisms would have been in big trouble, as the specific environments (rivers, lakes, marshes, beaches, seas, etc.) many would have been tightly adapted to would have been replaced with a violent, muddy, highly contaminated mess. Coincidentally in my last post (written before I had even read yours) I outlined just some of the major problems YECs have in explaining the survival of angiosperms during the Flood, and the fossil record of angiosperms, and their supposedly hyper-rapid diversification afterward. We’ve already discussed similar problems for horses, rhinos, and marsupials, and other groups, and countless ways YEC claims don’t match the evidence, or even comes close. I am tempted to cite even more problems for even more groups, but I’m feeling like we are starting to beat a dead horse, or would that be a dead rhinoceros? In Gilgamesh, the flood only lasts twelve days. Presumably, the author(s) of the Genesis flood story wanted to show how far the power of YHWH/Elohim extended beyond that claimed by the Mesopotamians for Enlil. The flood story, too, is the product of a long process of evolution. I wish other YECs were as frank as Wood sometimes is about the lack of YEC answers for these and other serious questions, especially the stark contradictions to the fossil and geologic records. Unfortunately, he and his coworker Wise (who does have training in geology and paleontology) seem unable or unwilling to take the next step and question whether their commitment to an ultra-literal, YEC interpretation of Genesis might be flawed. In the light of conventional wisdom a really good answer cannot be given, we have to look further. Standing on the sholders of giants, including De Vries, Schindewolf and McClintock, I was able to do so and gave the answer in a series of articles published between 2008 and 2013 in the JoC. And in my 2008 book. The very short answer: Speciation is instant and driven by TEs, probably in a semimeiotic way. It is instant evolution, which does not require eons of time. For this YEC the horse is a creature for the run/walk. This was not done on creation week, no death. The horse body is entirely a adaptation to running in herds. Theyt are not found below the k-t line, flood line for many YEC, and imagining them in herds while with all those strange other creaturese, dinos and others, makes it demanding the HORSE kind was some small almost deer like creature moving in the underbrush. only after the flood did it explode in diversity. So the KIND from which horses come within might include many other types. RHINOS?? etc etc. Always remember himasn being diversity is the example of diversity within one kind. Yes there are different human species as bodyplans have been changed by mechanisms yet still all from Noah and family. Creationists and sharp people everywhere must at least have this diversity option for creatures as we have for ourselves. That too is contrary to all genetic and fossil evidence. Speaking of the fossil record, it’s rich that you suggest there is no problem with pre-Cenozoic horse or horse-like forms, when it’s actually a huge problem. Whether early horses traveled in herds or not, they would have been living at the same time (and in overlapping habitats) with many dinosaurs (of many different sizes and habitats) and other pre_Cenozoic animals, so to find not one pre-Cenozoic horse makes no sense in the YEC/FG framework. But that’s just the beginning of the problem for YECs, because hundreds of other large modern mammals are also missing from the entire Mesozoic and Paleozoic (humans and other apes, whales, dogs, cats, hippos, rhinos, elephants, cattle, deer, bears, etc), despite their widespread and overlapping geographic distributions. The only attempted explanations YEC have for this (eco zonation, differential escape abilities, and hydrologic sorting) do not solve the problem, and often only make matters worse. 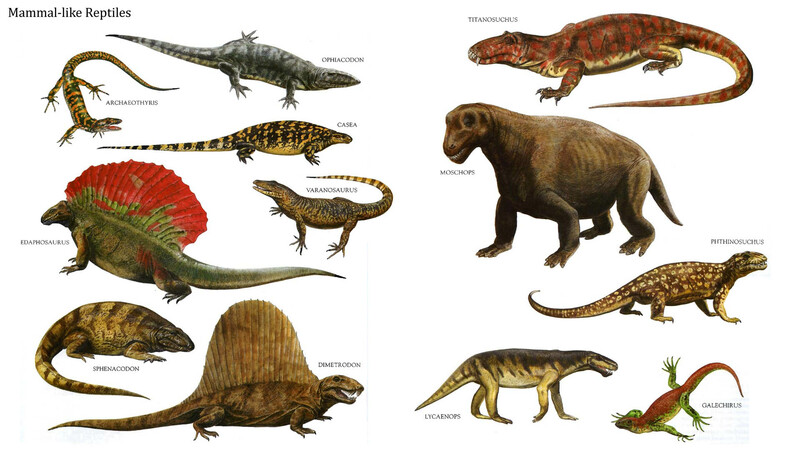 For example, if any hydro sorting took place during the flood, then small dinosaurs and similar sized horses, rhinos, hippos, etc should be sorted together and fossilized together at times, or at least at the same geologic horizons. But they never are. How do you explain that?The few alleged exceptions do not stand up to close scrutiny, as even AIG acknowledges. What we see now in extant species is only the remnants of an incredibly compact, beautifully created, most sophisticated information carrier with the potential to fully cover all creviches and niches of a barren world. I myself have been thinking about one or two baranomes for all marsupials. I think there is evidence for this. It would not be more unlikely than the 500 species of cyclids, which evolved in less than 12000 radiometric years. This is even better. When you write up that article for Nature, be sure to include Byers as a source! So perhaps you could elaborate, Robert Byers, on the number and scientific names of the different human species that are, you believe, one kind and are all descended from Noah. Apart from modern Homo sapiens, are you including Neanderthals, Denisovians, homo habilis, homo erectus? Others? And these are/were descendants from offspring of Noah that survived the Flood at what date, IYO? I don’t agree with these other groups they make up from a few bones. by species I mean modern man. The modern segregated bodyplands of mankind indicate original segregated populations that had morphed from a original parent population . So since the mechanism did the trick then speciation has occurred. That we can reproduce together is irrelevant to the mechanism and nature. Humans are as different species as butterflies are. We are not one species as they try to say based on reproductive compatibility. .
Robert, Homo erectus and many other hominids are known from more than just a “few bones.” In many cases we have largely complete skulls and/or significant portions of their skeletons, often from multiple individuals. Many show average brain sizes much smaller than modern humans, and many other intermediate features. That’s why YECs themselves can’t decide which are “human” and which are “ape,” even though they need to pigeon hole them as one or the other, and even though biologically and taxonomically, humans are great apes. Really Byers?. What are the individual extant human species then? Are they all equal in ability? I see, revisiting this thread a month or so later and discovering that as I suspected I had missed some posts first time around, that Robert neglected to answer TSB’s question about the different “species” of modern humans. Perhaps unsurprisingly he was reluctant to openly admit to the sort of racist sentiments that underlie pseudoscientific claims of that sort, whether made, as they have been, sadly, in the past, by atheist or religious bigots and supremacists. But I remain baffled by what crazy reasoning one can argue that the being able to interbreed and produce healthy fertile young is NOT evidence that individuals are of the same species, while unspecified differences in “body plan” ARE. My cousin, a white male of Scottish ancestry, is married to a Japanese woman. What are the body plan differences between this female and a female of Anglo- Saxon/Viking ancestry such as myself, Robert, so significant that you consider us different species? And what species are my cousin’s children? Or are the Japanese and those of Northern European ancestry the same species? In which case I’d be interested to know which racial groups DON’T belong in that species, IYO, what disqualifies them, and from which white supremacist you derived this pernicious rubbish? Robert, human beings all share a single “body plan.” That is why we can make human anatomy textbooks that describe where various organs are without having multiple body plan cases to enumerate. Perhaps you are thinking of “body types.” A tall, skinny person has a different body type than a short, stocky person. That is simple variation within the genome. Body plans are at a much higher level of differentiation; think Cambrian explosion, different phyla, etc. Clark, whether Robert is talking about actual “body plans” or just “body types,” his comments are absurd and at conflict with each other as well as the relevant evidence. One second he is talking about horses and rhinos being the same kind and having the same body plan; the next he’s talking about different human species based on different body plans. How he imagines there is a shred of consistency or common sense in this is beyond me, even aside from his redefining scientific terms any way he likes. They’ve done DNA analysis on hundreds of ancient remains to trace the domestication of cats from neolithic Europe around 6,500 BCE to the present. The genetic continuity and gradual evolution from “ante-diluvian” sites to modern times surely poses a problem for the Creationist proposal that all cat species hyper-evolved from a basal feline some time after the flood. It is interesting but teh data are viewed through Darwinian glasses, so you know the conclusions upfront. We need more creation science glasses and biologists who are not afraid to think outside Darwins box. And publish their thoughts, too. First, I am not sure what data you are referring to, but in regard to my questions about the fossil record, feel free to explain the patterns even with your YEC glasses. Second, I for one started out without any evolutionary “glasses” and would have been find accepting YECism, if that’s where the evidence led. In fact, I spent years trying to make YECism work. It just didn’t. In fact, the more I studied the evidence, especially in the field, the more obvious that was, and that the bulk of the evidence starkly contradicted YEC claims. In contrast, many YECs seem thoroughly committed to their views, and their assumption that Genesis is all literal, and won’t let any amount or weight of evidence change their minds. Are you an exception, and are open to considering that perhaps your view of origins or interpretation of Genesis is incorrect? Otherwise, why are you suggesting that other put on YEC glasses, if you’re not willing to put on mainstream glasses, or even take your YEC glasses off? Robert, do you have any plausible answers to these problems? Obviously, they and countless others would be avoided if you gave up your unnecessary assumption of an ultra-literal Genesis. Robert B, do you believe the ancient rhinos and rhino-like animals were also part of the horse kind? Do you think they and all horses arose from a single horse-like pair that came off the Ark in a few hundred (or even a few thousand) years? 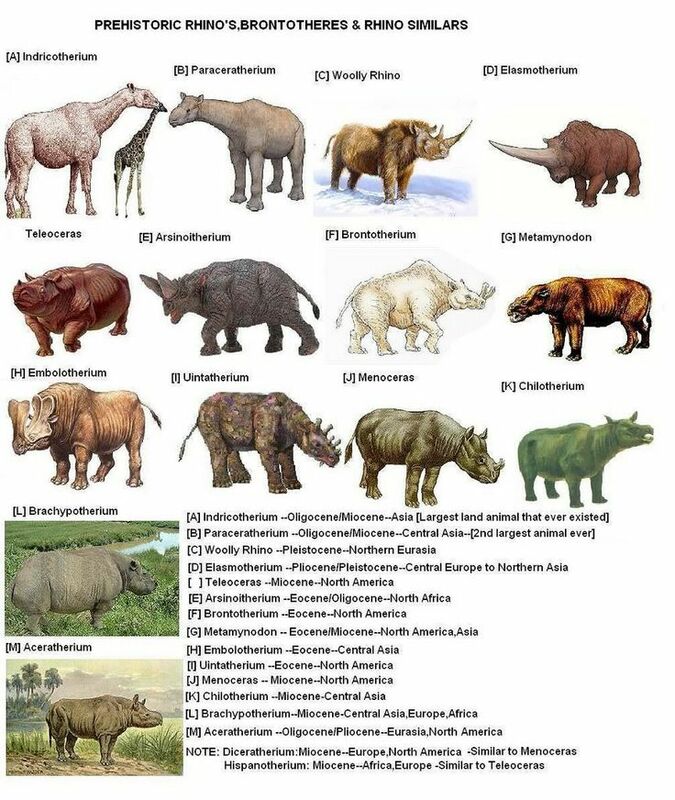 Can you explain why there are no pre-Cenozoic fossils of any of them, nor any hippos, cattle, deer, giraffes, bears, or other large modern mammals, despite many being as large as many small to medium sized dinosaurs, with similar and overlapping habitats and geologic ranges? How does any Flood model explain that, even aside from the severe genetic problems? This is a good illustration, as a good option, for what can be included in a KIND. i’m not sure rhinos and horses are from the same kind but in the fossil diversity of Rhinos one will find running rhinos and this with very horse like legs. Yet these pictures of creatures easily should be put into one kind. Today we are just looking at the winners in a great spectrum of diversity. Its always this way if one knows the fossil record. What the “horse” kind looked like on the ark is obscure. Its only by comparitive anatomy etc etc that one can link things. For everybody. the mechanism for diversity is not selection on mutations. therefore , just like theropod dinosaurs are REALLY, I say, flightless ground birds in a spectrum of diversity, so the ‘dinos’ below the k-t line might just be a diversity of horses/rhinos/elephants etc etc. not reptiles. The weirdness of bodyplans should not blind to a option for simply a KIND morphing as needed. YES your pictures show possibly just more dinos and not very different creatures as they now say. Horses didn’t exist before the flood in the modern bodyplan. This because they are made uniquely to be constantly in a herd and on the run or trot.including coloration like with zebras to blur them while on the move. Meanwhile, other YECs are insisting that birds are unrelated to dinosaurs, and that there are multiple bird “kinds.” Are you actually suggesting all birds and theropods are the same Genesis “kind?” If so, can you tell us what the original bird/theropod “kind” looked like, before it evolved into more than two dozen orders of modern birds alone (owls, swans, flamingos, penguins, parrots, hornbills, kiwis, sparrows, storks, eagles, ducks, vultures, ostriches, etc.) as well as numerous theropod genera (velociraptors, carnosaurs, ornithomimids, spinosaurs, pachycephalosaurs, etc), all within a few thousand years or less, without any involvement of mutations or natural selection? Whatever you envision, you are again making even AIG’s most extreme hyperspeciation claims look mild by comparison. At the moment yEC is not saying theropod dinos are birds but i think in time they will be forced to and welcome it. Theropods are so bird like, wishbones and feathers aplenty, that denying the likeness to birds will be impossible. So acturalety seeing them as flightless ground birds in a spectrum of diversity will settle morphology issues, and feathers, and flight claims by evolutionists. They just see them as reptiles like the rest of the people at the moment. On the ark there were two kinds of birds and so birds are not one KIND it seems. Its a bigger group seemingly. Mechanism for biology change has not been demonstrated by evolutionists and so its open to ideas. I’m wondering why Robert (and now, apparently, peer) think that rhinos and horses are even related. After all, they don’t look at all alike. I was wondering the same thing. They seem to go largely by general “shape”, and Robert once implied they had “similar legs,” but I agree that in general, rhinos and horses don’t look very much alike, even going by external appearances, let alone skeletons, internal anatomy, and genomes. I have read about rhinos relationship to horses in regular evolutionists teachings. I understand there are much overlapping. I’m not sure they are of one kind but it making the point of how diverse a kind can be. there are rhino fossils of rhinos with running ability . Yes, Robert, like all mammals, rhinos and horses are related, but by all fossil, genetic evidence, and radiometric dating evidence, their common ancestor was millions of years ago, not a few thousand years ago. Strange, then, that “regular evolutionists teachings” don’t hold much value for you when it comes to things like litopterns not being horses, or thylacines not being wolves. There is no “overlapping” between horses and rhinos. The so-called “running rhinos” which are in a different family, Hyracodontidae, than modern rhinos, are not particularly “running adapted” (nothing like a modern horse), only in comparison with modern rhinos. Modern rhinos can also run pretty fast if they want to. Robert B, you wrote, “I have read about rhinos relationship to horses in regular evolutionists teachings. I understand there are much overlapping. I’m not sure they are of one kind but it making the point of how diverse a kind can be.” Some of what you read may have been from our friend Christine Janis, who happens to be a world-class paleontologist and recognized expert in fossil mammals, especially ungulates. I should think you’d seriously consider what she has to say about the fossil of horses and rhinos, but so far you have not offered anything concrete to counter her observations, nor any of the other fossil evidence we have pointed out that flies in the face of what you and Peer have been saying. By the way, in a recent post I made a silly typo, writing that Gish talked about fossils always being “funny functioning”. As you I trust most readers surmised, I meant “fully” rather than “funny”, although I guess the typo itself was kinda funny. Peer, you suggest that all marsupials arose from a “single marsupial-like organism” and like Robert B, that all rhinos and horses (modern and fossil) are the same “kind. I’ve already posted all the rhinos that have to evolve from you Ark-departing horse. Do you realize that there are at least 8 orders (yes, not just general or families, but ORDERs) of marsupials, comprising hundreds of known species, with massive differences in anatomy, habitats, diets, and behaviors? To suggest that all kangaroos, wallabies, koalas, opossums, wombats, Tasmanian devils, sugar-gliders, potoroo, quokka, and many others) evolved from a single pair of animals that departed the ark, strikes me as beyond absurd. it makes AIG’s hyperspeciation claims look tame by comparison. You suggest this such radical notions of evolution are similar to “the 500 cyclids arose in the victoria lake” Hardly. Lake victorial cyclids are in the same family, and are far more like each other than are the different families and orders of marsupians, or the differences between rhinos and horses, even just considering modern species. You also wrote: “The first Marsupial banome was probably carried to australia as a pet….in the boats of what evolutionists call Homo erectus (but who were just Homo reshuffeled baranome derivates). Well, takes the cake when it comes to imaginative ideas on how marsupials got to Australia. Aside from your radical ideas about the mechanisms, you seem to entirely disregard the fossil record. In my previous posts I asked a number of key questions about fossil patterns that you and Robert B have not responded to. In regard to Homo erectus, if your model is correct, we never find the with modern human remains (or even at the same geologic horizons)? I see marsupial traits as trivial adaptations upon migration to parts of the planet. They are simply the same creatures as elsewhere. So it explains their movement after the flood. Thats why there were marsupial lions, wolves, moles, mice, etc etc. Thats why convergent evolution must be invoked by evolutionists to explain the unlikely results of such same shaped bodyplans. Once again the error is led by error in classification. How do you explain kangaroos, then? Kangaroos I understand to just be big wallabys. They are just in a spectrum of size/type. They would have their cousins elsewhere but those went extinct everywhere else. There are heaps of fossil creatures found everywhere now extinct. Easily can the cousins of kangas be found elsewhere. I read of a option in S america once. You should not be asking this question but anticipate this answer. Kangaroos and wallabies are indeed the same type of animal, distinguished mainly by size (at least within the genus Macropus). This does not help your claim that all Australian marsupials are replicates of placentals found elsewhere. There are no examples of large hopping placentals among living placentals, nor in the fossil record. Perhaps you want to claim that kangaroos are merely large jerboas? I expect you are thinking about the microbiotheres, which although South American marsupials have been shown by both morphology and genomic data to be the sister taxon to all of the Australian ones. Or perhaps you are thinking about the argyrolagids, extinct hopping South American marsupials. Neither possibility helps your claim that all Australian marsupials are replicates of placentals found elsewhere. It is quite impossible to anticipate your reply to any new question, Robert. Your replies are always such a strange amalgam of barely remembered (and misunderstood) things that you once read somewhere and your own imagination. But nothing you have said here helps your claim that all Australian marsupials are replicates of placentals found elsewhere. It gets even worse when you add in the fossil diversity. Sheep to rhino-sized diprotodonts, tapir-sized palorchestids, leopard-sized carnivores that sported a huge claw on a rotatable thumb, kangaroos that stood 8 foot tall and walked bipedally rather than hopped. And that’s just Australia —- in South America there was a diversity of carnivores (an entire order, comprising 4 different families) including a saber-toothed one, as well as lots of other types of now-extinct marsupials. Are you seriously suggesting all those mammals are in the same “kind” as dinosaurs, which in turn, are just flightless birds? Good grief, why not throw in amphibians and pterosaurs while you’re at it. IN fact, since you’re already combining not only different orders but even different classes into a “kind,” why not go the full monty and call it the “vertebrate kind”? I’m only half joking. You seem to have such a broad and loose definition of “kind” where do you stop, and on what basis? what the truth is IS that there are kinds. Theropod dinos are just flightless ground birds. not reptiles or dinos. Other dinos likewise can fit into OTHER kinds. these other kinds including them and modern creatures. for example there are reptile/mammal creatures they talk about. yet in fact they simply are a diversity of kinds that includes creatures that might have a few traits associated with reptilianism or mammalism. Yet there are no reptiles or mammals. These groups don’t exist. SO the KIND can include modern bears or bear like dinos. (I think there were a few). its about classification and morphology and how to group things. I say the traits that historcially grouped creatures is wrong. Only modern research now with theropods showing them to be so bird like hints at a new revolution in classification. Robert B, you wrote: “Other dinos likewise can fit into OTHER kinds. these other kinds including them and modern creatures. For example there are reptile/mammal creatures they talk about. yet in fact they simply are a diversity of kinds… Yet there are no reptiles or mammals. These groups don’t exist. Joel once wrote a post about some die-hard Paluxy “man track” promoters such as Aaron Judkins and Carl Baugh, asking whether it is worth addressing at what point is it worthwhile to address claims of those at the fringe of the fringe. Well, no offense, but when you suggest that all marsupials are the same “kind,” that all theropods and birds are the same kind except ravens and doves, and now that dinos and mammal-like reptiles and “bear like dinos” (which don’t exist) are also the same kind, you’re showing yourself to be on the fringe of the fringe of the fringe, even among YECs. So maybe I should not say more, or perhaps have said too much already. However, I’d like to make a couple more general observations, in case you might take them to heart. When it comes to the basic biology and anatomy of various groups, and especially their fossil records, you and Peer seem to be largely going by superficial reading and vague recollections, rather than thorough search, or even respecting what paleontologists and biologists have explained here. That’s hardly the best way to build a sound model of Earth history, even the ideas your ideas speciation and genetics seemed valid or even plausible, which they don’t. I noticed Peer commenting in another blog that “Extraordindary claims require extraordinary evidence.” Yet you and he have made many extreme claims and wild speculations here (from bear-like dinos to H. erectus boating to Australia with marsupial pets), without a shred of ordinary evidence, let alone extraordinary evidence. Please consider all we’ve pointed out, and the possibility that all these problems would be avoided if you’d free yourself from your unnecessarily rigid and narrow interpretation of Genesis. As a follow up to my last post, I am wondering how many animal “kinds” Robert and Peer think were on the Ark, and what they looked like. I realize that part of of AIG’s motivation for pushing their hyper-evolution idea is probably to reduce the number of “kinds” on the Ark to something potentially plausible, but at the rate Robert is lumping orders and now classes together, it seems like Noah could have made do with a 40 ft ferry boat instead of a 500+ ft Ark. Yet most do deny it, and ICR still insists that there is no evidence that any dinosaurs had real feathers. Don’t you see your own contradiction? One moment you’re suggesting that theropods and birds are all one kind, the next you’re asserting that doves and ravens are different kinds. Are you suggesting there were two and only kinds of birds on the Ark (doves and ravens), but no theropods (since they are just ground-going birds)? Why would doves and ravens be different kinds, but birds as different as kiwis, vultures, owls, hummingbirds, and ostriches, be the same kind, and even the same kind as theropods? Another question for Robert and Peer: If animals as different as hummingbirds, owls, and theropods are the same kind, and if kangaroos, sugar gliders and possums and are the same kind, then why are humans, gorilllas, chimps, and orangs not the same kind, since morphologically and genetically, the differences between them are far smaller? Peer has opined that all angiosperms are the same kind. It’s the old creationist strategy — the further you get from humans, the more all-encompassing the kind. Hence, we can have the “bacteria kind”, encompassing 2 out of the 3 domains of life. I recall reading YEC writings about the horse series as a teenager, 40+ years ago, when I was a YEC as a new convert (long since became OEC). One of the major points they made was that the “horse series” hopped around from Europe to North America, i.e. some fossils had only been found in one place or the other, so it was unclear how the descent could happen. Have more recent fossil finds changed this objection at all? This is one of the creationist claim that I covered in my “Horse Series” paper, mentioned in the first article here in the Horse Series. It’s not clear to me whether this comes from simple confusion or a deliberate attempt to mislead people. The earliest horse, Hyracotherium (= Eohippus), is traditionally known from both North America and Europe (although these are now thought to be different taxa, and the European one may not even be a horse, but instead a member of the related, exclusively European, family Palaeotheriidae). Following that animal, the traditional members of the ‘horse series’, as originally promoted by American paleontologists such as Osborn, and portrayed in textbooks for the past century, is entirely North American. That is, all of the taxa that can be included if a single line is traced from Hyracotherium through to Equus (the genus of modern horses, zebras and asses), are exclusively North American: Hyracotherium, Orohippus, Epihippus, Mesohippus, Miohippus, Parahippus, Merychippus, Pliohippus, and Equus. Not only are all of these “Horse Series” all from North America, they can all be found in Nebraska, and are all housed in the University of Nebraska State Museum. There were a number of other exclusively North American genera that were not on the direct lineage to Equus (e.g., Hypohippus, Archaeohippus, Nannippus, Neohipparion) and some that were on the direct lineage to Equus but were not part of the original “Horse Series” (e.g., Acritohippus, Astrohippus, and Dinohippus). Where the confusion may come in is that Equus itself, although first appearing in North America at around 5 Ma (millions of years ago), then migrated across to the Old World (~ 2.5 Ma) and (separately) down to South America: Equus became extinct in the Americas at the end of the Pleistocene, around 12 thousand years ago. There were other, earlier migrations of horses from North America to the Old World, but these were various ‘side branches’ (if one views Equus as the ‘evolutionary end point’), and were not directly involved in the ancestry of Equus. These included the anchitheres (e.g., Anchitherium, Sinohippus) in the late early Miocene ~ 17 Ma (they survived in Eurasia until near the end of the Miocene) and the hipparionines (e.g., Hipparion, Shanxihippus) in the early late Miocene ~11 Ma (they survived in Eurasia and Africa until near the end of the Pleistocene). Great summary. Thanks for taking the time to help us here. Back in the late 1970’s, when I was in high school and believed in YEC, I read a critique that the “horse series” hopped back and forth between European fossils and North American fossils. When I mentioned this in discussion with another boy who was a staunch atheistic evolutionist, he said it was not true and would prove it. The next day, he brought a book about evolution to school and shoved it in my face, with a family tree drawing. I looked at it and pointed out that he had not read the caption and legend, which indicated that the names in parentheses and the names in brackets indicated fossils only found in Europe and fossils only found in the Americas. The family tree was interrupted in several places with these notations. He stormed off and basically never spoke to me again. I remember it well. So, there could have been fossil discoveries since the mid-70’s that filled in some data and removed these geographic barriers, and some YEC writings could be outdated, but I don’t think it is a deliberate attempt to mislead people. It is just a fact that, at one time, evolutionary textbooks had a horse series that they proudly showed off, even though the geographic hopping made no sense at the time. The original horse straight line “evolutionary series”, as presented in the early 1900s (Osborn/Matthew) was of entirely North American horses. That is: Hyracotherium (aka ‘Eohippus’, now ‘Protorohippus’, the term ‘Hyracotherium’ now reserved for European taxa), Orohippus, Epihippus, Mesohippus, Miohippus, Parahippus, Merychippus, Pliohippus, and Equus. Apart from Equus, all of those taxa were exclusively North American. After its origin North America, species of the genus Equus migrated out of North America, to Europe, Asia, Africa, and South America. The end-Pleistocene megafaunal extinctions resulted in the extinction of all equids in the Americas. That ‘straight line’ depiction of equid evolution fell out of fashion in the later part of the 20th century, so the textbook that you would have seen in the 1970s (probably following the famous one of G G Simpson*) would have shown a ‘bushy’ pattern rather than a straight line. That would have included a representation of two major ‘side branches’ to the lineage leading to Equus: The specialized large-sized browsing anchitheres (early to late Miocene), branching off at the level between Miohippus and Parahippus; and the hipparions, which branched off at the level of Merychippus in the mid Miocene. Hipparions paralleled the lineage leading to Equus in many ways, becoming grazers with high-crowned teeth, but remained persistently 3-toed, while later members of the Equus lineage became single-toed. The hipparion lineage was much more diverse in terms of numbers of species during the Miocene than the one leading to Equus, and they persisted until the Pleistocene. Anchitheres and hipparions radiated in both North America and, separately (and long before Equus) migrated over to the Old World in the Miocene and had an independent radiation there. Hipparionines reached Africa, but the anchitheres did not. These are the genera known from outside of North America. They are all quite different genera even from the representatives of their own lineages known from North America, and are nothing whatsoever to do with the lineage that remained in North America until the Pleistocene and eventually evolved into Equus. The bushiness of the overall evolutionary pattern of the family Equidae is interesting and important, but does not detract from the fact that a straight line can still be traced from Equus back to the early Eocene ‘Hyracotherium’ (or equivalent), all genera exclusively North American until the Pleistocene dispersal of Equus. Hope this helps. As an analogy, one might say that the supposed African lineage of human evolution is disproved by the fact that primates are also known from South America, Asia, and Madagascar. Yes they are, but those are not on the specific lineage leading to the genus Homo. Christine, thanks for all the great clarifications and additional info on horse evolution. All that you say, and the additional info in the pigeonchess article, points to even more problems for the YE/hyperspeciation view. Even aside from the severe genetic bottlenecks after the Flood and lack of hyperspeciation mechanisms, I don’t see how YECs can explain the geographic and geologic distributions of horse fossils. If horses arose from a single pair of horse-like animals that came off the Ark a few thousand years ago, even if they did manage to speciate at breakneck speed, why don’t we see a distinct pattern of migration and diversification originating in the middle east? Also, if we assume that something similar to the basal fossil forms came off the ark (as AIG seems to suggest), which don’t look much like modern horses, then YECs have very little time for them to turn into the horses referred to in the Old Testament, which apparently were very similar to modern horses, unless they want to suggest that ancient chariots were drawn by little three-toed equines. Anchitheres and hipparions radiated in both North America and, separately (and at different times) in the Old World: hipparions reached Africa but anchitheres did not. None of the genera in these lineages known from the Old World can be found in North America (and vice versa) (there’s something called ‘Hipparion’ in North America but it’s not the same taxon as the one of the same name in the Old World, although it is a hipparionine). In fact, the only equid genus known from both Old and New World faunas is Equus (in the Pleistocene). Actually, Paul’s figure seems closer to what AIG indicates. In one of their articles they use OT genealogies to place the Flood at 2348 BC. Of course both dates are contradicted by massive amounts and varieties of evidence. Even YEC Gerald Aardsma found that a careful review of tree ring studies (including modern trees overlapped with semi-fossilized specimens) provided a continuous and reliable sequence of at least 11,300 years, providing incontrovertible evidence that “the Flood must have occurred more than 10,000 years ago.” (CRSQ, 1992, Vol 29). He carefully examined and rejected YEC objections to these results (multiple rings per year, etc–which are uncommon), and challenged his fellow YECs to frankly face the data and its implications. Sadly they have not. As far as I know, even Aardsma has remained a YEC, and disregarded his own advice on many other lines of evidence that demonstrate that the earth is far older than 10,000. This discussion sent me back to my copy of The Genesis Flood, foundational document of the twentieth century upsurge in creationism, where I was surprised to find that the authors avoid any serious attempt to estimate, give reasons, within their belief system, for not regarding the chronology of Genesis 11 as exact or complete, and suggest considerably more time (how much more time they do not say) than calculations like Bishop Ussher’s would give between the Flood and the time of Abraham. As Glen points out, present-day creationists are less cautious. I wonder, incidentally, how far back in literature we can trace the horse in its modern form. What about the Sumerian literature, much of which, even if the Bible is taken at face value, predates Exodus? This is so rich, since the among those who used to say that all the time were leaders of ICR and other YEC groups, including Henry Morris, the “father of modern creationism.” The only way Hodge would not know this is if he himself hadn’t sufficiently “researched the subject.” At any rate, it strikes me as funny that AIG writers are now essentially indicting some of the most renown founders of the modern creationist movement as poor researchers and compromisers. The irony of that hadn’t hit me until you brought that to my attention. That really is a great point. Yes, I too have noticed that whereas Henry Morris and many other YECs used to avoid giving a precise date for Creation or the Flood, often saying the former occurred “about 6 to 10 thousand years ago” now most don’t hesitate to flatly state that the earth is 6,000 years old, and that the Bible “clearly teaches this.” Most seem to base this on OT genealogies, even though H Morris himself acknowledged that the Hebrew word for “begat” can and often did refer to a descendant (even a distant one of historic importance) and not immediate child, which to me seems to render them useless as precise chronometers, even if the lineages given are largely correct (despite some apparent contradictions). Morris argued that any gaps are probably small and insignificant, but this seems like a weak argument at best. Morris (to be fair) even acknowledged that what was begotten, or called a “son”, could be a more remote descendant or even a group, not just an individual. In this he is clearly correct; not only are the Israelites called the “sons” (usually translated as “children”) of Israel (we meet “Israel”in Genesis as a name for Jacob), but one of the “sons” of Ham is Mizraim, or Egypt. Even more to the point, Mizraim is a gramatically dual form, meaning “the two Egypts”, so whoever wrote this verse knew of the union of Upper and Lower .Egypt, and by impliction was assigning the passage of historic time between Ham and his “sons”. As I said earlier, Morris acknowledged in his writings the the Hebrew word for begat could, and sometimes clearly did, refer to descendants rather than immediate sons, which was one of the reasons he hedged on the date of Creation. Oddly, most YECs seem to have brushed that aside in recent years, and most parrot and push the 6,000 year figure, although I can’t find any place where ICR gives a precise date, maybe because their founder didn’t. The problem is, if there are gaps in the geneaologies, there is no way to say exactly how large they are. AIG must know this, so I guess they’ve decided to say nothing about it and hope few of their followers notice. YECs like Aardsma could hold their feet to the fire on the tree-ring dating, which he said in 1992 (CRSQ, Vol 29) was plain evidence that the Flood happened more than 10,000 years ago, but evidently he’s decided to not push that in recent years. Indeed. I was referring to a much narrower detail, where the Hebrew is unambiguous:Mizraim (the Two Egypts) as a “son” of Ham, with the implied elision of the time period between the Ark and the unification of the two kingdoms. I find many of their arguments rejecting the possibility of gaps to be weak, and think the burden of proof should be on them to demonstrate the lack of gaps (they seem to see it the other way around), but I guess in their minds, it fits with their general view that virtually everything in Genesis should be taken literally. Interesting, in complete opposition to Ham and others at AIG, in the appendix of The Genesis Flood, Henry Morris argues that the genealogies of Gen 5 and 11 “Need not be interpreted as a strict chronology…”. For example, he states, “,..it seems that the strict chronology view must be set aside in order to allow for the death of the patriarchs long before the time of Abram.” Later he says, “Within the genealology of Genesis 11 there are additional indications that we are dealing with something other than a chronology.” He then presents several arguments for the conclusion, which the AIG people either neglect or dispute (without mentioning that H Morris once advanced them). This is great research. I had never noticed that before. In fact, I don’t think I’ve looked in the appendix. Is that in the first edition or maybe added to later additions. I will look at my 1963 copy tomorrow which I have at my office. Thanks Joel. It’s in the two copies I have, one of which is the 1981 printing, and the other a 2003 printing, and as far as I know, all the text in both is identical. As I mentioned in some Comments to another of your articles, the 2003 version still promotes the Paluxy tracks, without any qualification or disclaimer, in contradiction to J Morris’ own 1986 recommendation that YECs no longer cite them as evidence against evolution. I believe I have an even more recent one around somewhere that also does, but I can’t find it at the moment. Some YECs suggested to me that ICR may feel the book is too much of a “classic” to alter in any way, but that would not prevent them from including at least a corrective insert, addendum, or appendix addition, or editing clearly erroneous material, especially since they did make a few changes in it over the years. I plan to order a new copy (and from ICR directly rather than Amazon or some 3rd party) to see if anything has changed. I have four or five editions but not the most recent printing. It was my understanding as well that they have been reluctant to make any changes. When can we expect part IV? Since baraminology is one of the chapters in the new book I’m coauthoring (The Rocks Were There: Straight Science Answers to some bent Creationist questions) I’ll want to include this series re Wood, Molen, Sarfati. Ah, variation within a population — the scourge of darwinian thinking! That population of horses (which, incidentally, belong to Pliohippus not Dinohippus, but that’s a common error due to taxonomic name changes) is interesting in other ways besides variability in toe size. Pliohippus, in addition to having greatly reduced side toes (even if some individuals remain technically ‘tridactyl’) has other foot features resembling that of modern horses, indicating a greater amount of extension at the fetlock joint and hence greater storage of elastic energy in the foot tendons/more efficient locomotion. A perfect example of a “transitional taxon” between a three-toed and one-toed horse (at least in the foot). The fun thing for the poor baraminologists is that the moment they let the barn door open for variation from Hyracotherium all the way to Equus, how can they keep that measuring stick from spilling over to related taxa and all their relatives, most obviously Homogalax and the tapirs, but ultimately … everything in the history of life. A few in the creationist world may realize how dangerous such an elastic stick can be, but they’re always facing the Ark imperative, to keep the Kinds down to fit in the available stall space. None of this occurs over in Intelligent Design or Old Earth Creationism land, since they don’t have that Ark issue, and hence they don’t even try to work out their own systematics (look at Gunter Bechly’s efforts at Evolution News, where he seldom even mentions his own specialty of insects, and most of the time sounds like Casey Luskin redux). The horse episode (and these new publications) will be included in the “The Rocks Were There,” which I hope will do for (or rather against) Answers in Genesis creationism what I did for highlighting antievolutionist goofs and evasions on the reptile-mammal transition in “Evolution Slam Dunk,” which I am so proud that you found both entertaining and informative. And we will not forget to mention Pliohippus! “The Rocks Were There.” Love it! That could be a bumper sticker, ha. That’s a possibility I’ve been pondering re my TIP (“Troubles in Paradise: The Methodology of Creationism”) project, product line of t-shirts, mugs, bookmarks etc that would be keyed to the concepts and shorthand terms I use in it, including the “Tortucan” mind shell notion, “Origins or Bust” (the urge of evolution doubters to scamper back as far as possible to avoid thinking about all the evolution evidence since then), etc., and make some extra money by it. I will keep all this in mind … while I slog along on the books (and “Evolution Hour” which is in a few hours again). Can’t wait to see your book. Please let us know when it comes out. Do you have an estimated publication date? I and Jackson Wheat (the Louisiana university biology student who I bumped into via pro-evolution secular video subculture) are keen at it. Cross fingers, but we hope to finish sometime this year. Still hoping for some contacts regarding doing a second (illustrated) updated edition of “Evolution Slam Dunk” too, but for that I’d need a standard publisher. If any in this network have some contacts I could pursue, let me know!